Lawns Laid with Top Quality Turf in Bath. Plants from the best suppliers. Whether it's an artificial lawn or a traditional planting scheme, we cover it all. This landscaping project in the heart of Bath transformed this garden overgrown garden into an elegant garden to match the Georgian townhouse. There are few things more satisfying than a newly laid lawn, put down by experts. 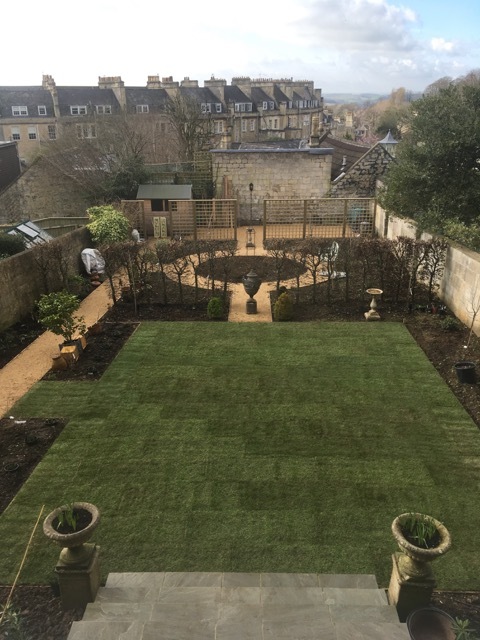 Turfing this garden in Bath really brought the garden together. This modern Bath garden in a new build home is designed for almost zero maintenance and is suited to the many busy professionals that live in the centre of Bath. Lawns in Bath are an essential part to many landscaping projects.